This is for our house. Time for something for us! Looking for detail/drawing for the above. The exterior wall is 11.5" thick. Would like to use white oak for the threshold. The very wide walls will require a 2 or 3 piece jamb to make the width, to panelize it to limit movement. If 2-3 pcs, then T&G them and set with a gap so they can move a bit. The sill should be no more than 8" or so, and even flatter, with exterior a down step to porch or porch surface running right up to the sill. If it is pocketed in the masonry, isolate the sill with lead or copper or aluminum or something to keep it dry. 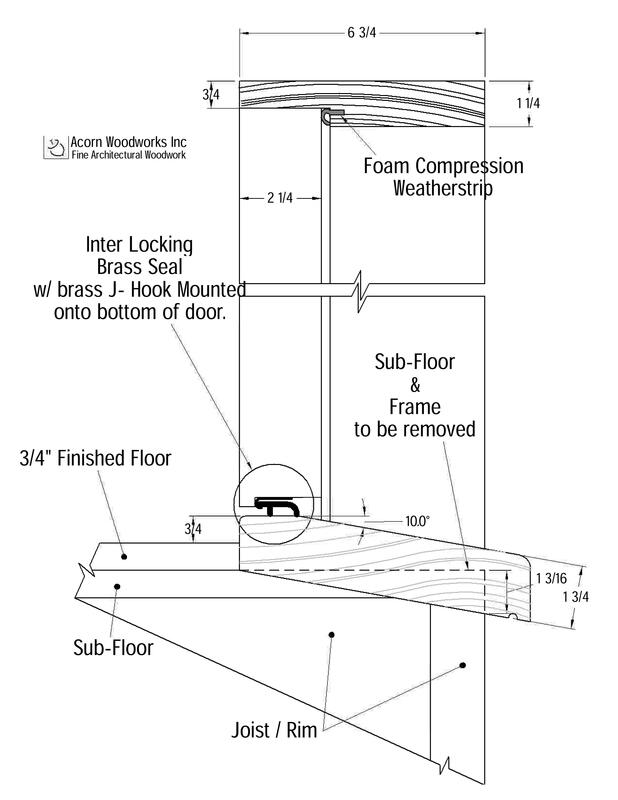 Our drawings typically have the bronze interlock for door bottoms, but you may have other preferences. I would make the jamb in two pieces and hide the ship lap joint behind the stop. It would be an applied stop like an interior door. White oak is the best choice for a sill. To limit the movement. Follow I would coat all 6 sides with epoxy resin wait a week(oil based finishes do not stick to epoxy for a week as it cures)and varnish it. Use a high quality polyureathane adhesive/sealant like Sika or PL to waterproof the jamb/sill joint rot will start there if any wear. Follow David’s basic sill design. I would keep the sill above the flooring to gain height. Cutting out subfloor is not a great idea. 10 degrees is ideal to shed water. That is a lot of height in a 12” wall. I would also rip many saw kerfs on the back hoping it will limit warpage. Saw kerfs on the back to limit cupping. If this is needed, then there is far too much water moving under the sill - and that is the real problem. I have never seen a sill warp - cup or belly - in all my working life. Finish: Epoxy coat is fine, until it fails. And it will fail. When that happens, watcha gonna do? Chip the stuff off? Remove the unit? I suggest that since all finishes fail in the weather, leave the White Oak to weather. It takes a bit of talking to the new home owner about why this is best, or you can let them finish it every 3 months, and still strip it every year. They won't rot, and the maintenance is an easy sell. They just need to get over their desire to have everything perfect. Must be a regional thing but Dave's drawing wouldn't meet code in our area as a trip hazard. Thanks for the replies. How about the sill width? I would like the door flush with the interior wall. So I am still needing a "wide" threshold.